One of a kind unique shoes for your little girl from Coastal Projections Shoes are a work of art. 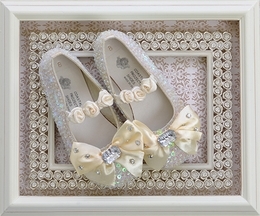 Each sequin hand beaded shoe is made to LaBella Flora's specifications. Adorned with rosettes, tulle flowers and ribbon bows too. Made to match many of our girls special occasion dresses for designers, Biscotti, Little Mass, and Ooh La La Couture. 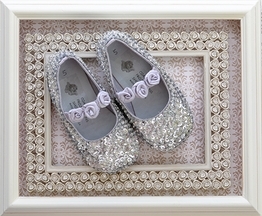 The little girl in your life will feel like a princess in her custom sequin shoes. Coastal Projections Shoes are perfect for special occasions! The sequined designs add sparkle to her step with hand beaded designs. 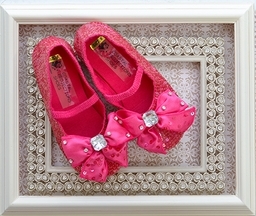 Bow accents, rosettes, and rhinestones sitting atop of sequins make these shoes shine! Each design is as unique and beautiful as your little girl! Coastal Projections provides an array of embellished ballet flats and Mary Janes that can be worn beautifully all year round.